I pulled my favorite fall/Halloween wreath out of the attic to hang on the door, and I found that it had not survived since last year. :( I took what I had on hand to make a new one, and I’m so happy the results! 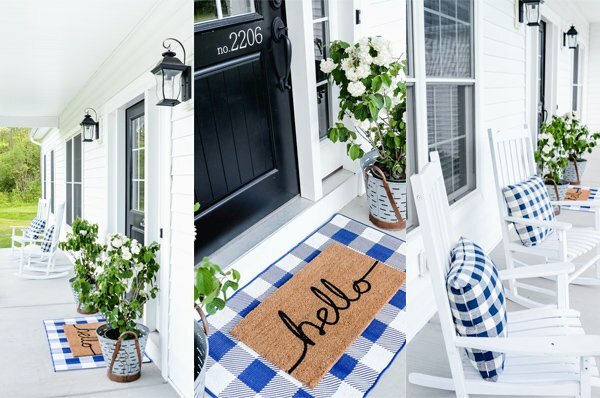 This is SO easy–and fast–and CUTE! It took less than 10 minutes to thread the ribbon through the wreath, and another 10 to make the pennant, making it a project you can do in less than 30 minutes. You can change the colors and design of the ribbon for any holiday or season, making it an extremely versatile. Here’s how you make your own!!! 1. 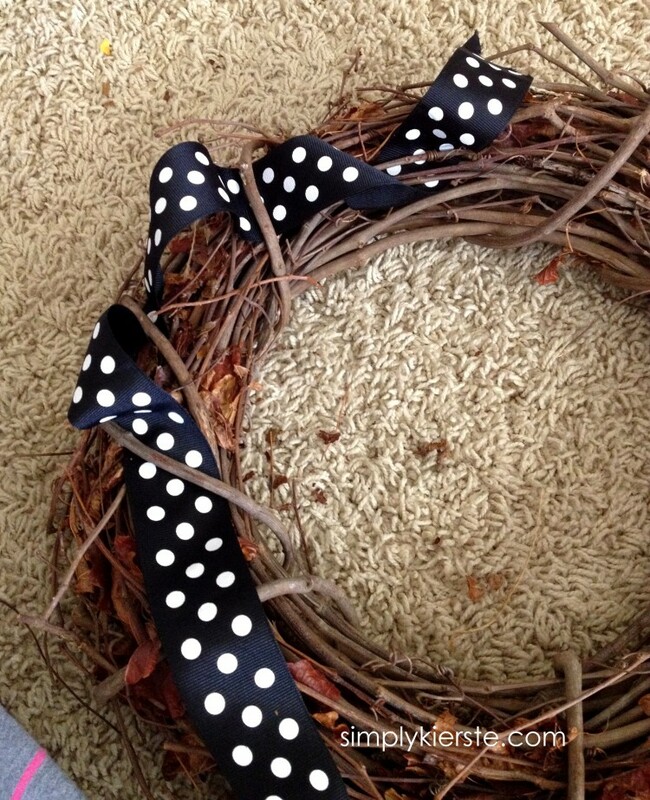 Thread the first ribbon up and under the branches of the wreath, leaving a little loop (not pulling it flat). I weaved from side to side–starting on one side and going under, leaving a little loop, then going back the other way. 2. I repeated the process with the second ribbon, making sure that I could see both of them. They can overlap, cross over each other, and be side-to-side–just maneuver it until you like the way it looks. The ends of the ribbon can just be tucked in to the wreath–it’s really secure, and shouldn’t move. If you want to hot glue them in, that’s okay too! 3. To make the pennant, I took small squares of felt, and ironed on white flocked heat transfer that I cut out with my Silhouette. If you don’t have a Silhouette, you can print out the letters you want on the computer (use a thicker font). Cut them out, then pin to the piece of coordinating (white) felt, and cut them out. Use heat ‘n bond or wonder under to apply it to the pieces of black felt. I’ve used this method many times, and felt is one of the easiest fabrics to work with. 4. Put a strip of hot glue along the top of each small piece of black felt, and press the ribbon down over the glue, to make a pennant. I used a little hot glue on both sides of the wreath to adhere the pennant to the wreath. So simple and cute! I will have to try this kind of wreath sometime! Maybe with Christmas ribbons and HoHoHO! Yes!! That would be adorable! This are so cute! I’ll be sharing it in my Halloween round up tomorrow and I’d love for you to come check it out!! Thank you so much, Meaghan! !